On Saturday 27th February 2016 Michael Jennings from St. Austell Bowls Club became Cornwall’s first ever male President of the National Association for bowls. Michael was delighted to take over the Presidential role and it was a very proud moment for him. He was delighted with the reception he has received from all the county members. Michael thanked Bowls Cornwall for nominating him for the role and the people who voted him into this excellent position. Michael is opening a few local Clubs this year including St. Austell, St. Stephen and Newquay West End and his first Bowls England Celebration game will be on the Isle of Wight in May. Michael together with Viv Tomlinson, Senior Vice-President, Bill Smith, Junior Vice-President and Marcia Dunstone, Immediate Past President form the Bowls England Presidential Team. They will be taking part in celebratory matches across England to help Clubs , Counties and Assosciations to celebrate anniversaries from 50 years upwards in 25 year increments. In adddition they will be supporting the National teams at various competitions and venues. 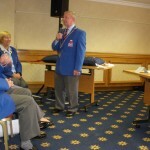 We at Bowls Cornwall are very proud of Michael and wish him a happy and successful year as President of Bowls England.